Fender switched back to the blackface era cosmetics some time in 1980. 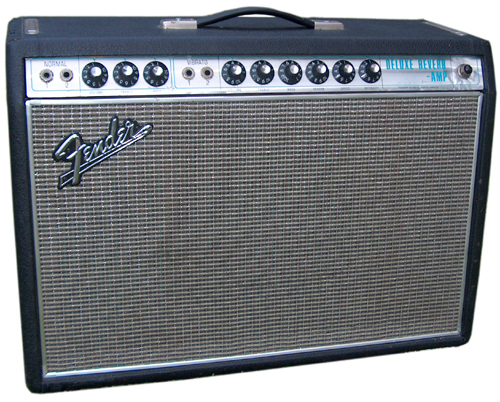 Deluxe Reverbs produced between late 1980 and 1982 have a black control panel and silver sparkle grille cloth. A “Boost” pull switch was added to the Volume control around ’77. A Line Out jack added to back panel around `79. I just bought a 1979 Deluxe Reverb. Does “fixed with bias pot” (above) mean that I can re-tube it without adjusting the bias? I had a Silverface DeLuxe Reverb 1978 in 1979-83. I remember it had 2 10″ speakers, instead of one 12″. Do i remember right, was there such a model version too in existence? Mark, my late ’69 DL has serial # A29479, if that’s any help. A guy named gagliano has a list of chassis serial numbers and advice on how to date the amp beyond just chassis number. Apparently fender made these in large lots and put them in bins and techs just grabbed any one and used them so a chassis could have sat around for a year before getting used as guys didn’t often grab them from the corners. DELUXE REVERBS BF AND SF ARE ALSO DIFFERENT AS MOST OF FENDERS ?? 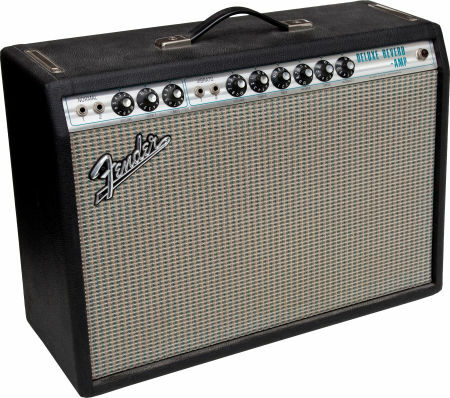 i have a 1979 fender deluxe reverb,and i never had the original speaker. i want to put the original type back in this amp.any suggestion what might have been original? been thinking about an oxford 12k5. 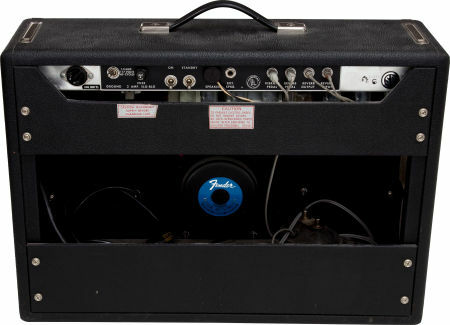 i do use pedals, but i would like to have this amp be a grab and go. guitar into amp. go. i also play a strat. thankyou very much! …mine (1980) also had a Pyle – I replaced it with a 1979 CTS and am most happy with it! Danny, Vin-Tone offers speaker re-coning and restoration of Era Correct speakers for these amps. We also have a large inventory of Era Correct speakers to choose from. Please contact us for options. I have a Reverb Deluxe Amp with serial number A895855 Can you tell what year this was made? What was the original speaker in a 1973 DR? Hi Jason. 606 means it’s a fender original transformer and 8-28 means 8th year, 28th week. So if it’s silverface it can be 1968 or 1978. I think a 1969 would have a silver border around the grill cloth known as the drip edge. I have a 71 silverface deluxe reverb with a 6L6 tube chart + tubes. Cannot find any info on this as most 6L6 DR I have seen are modified. I’m the proud owner/user of a 1971 DR. I had 2 late 1960s- early 70s JBL D110Fs laying idle, so I decided to use them in the DR. I built and covered a 2×10 baffle, and installed the D110Fs. The difference in tone was amazing: bigger lows that are tightly focused and broad, mids that are replete with the famous JBL punch, and crystalline, shimmering highs that only Fender can provide. Enthralled as I was, I knew I was not done. I added a SS rectifier, JJ 6L6s and a rebias and presto! I have a mini Twin. Since I play clean about 95% of the time, this little monster is just about perfect. The 6L6s add about 8-10 watts output, which is not enough to make the amp sound a whole lot louder, but it does provide clean headroom that is markedly increased.